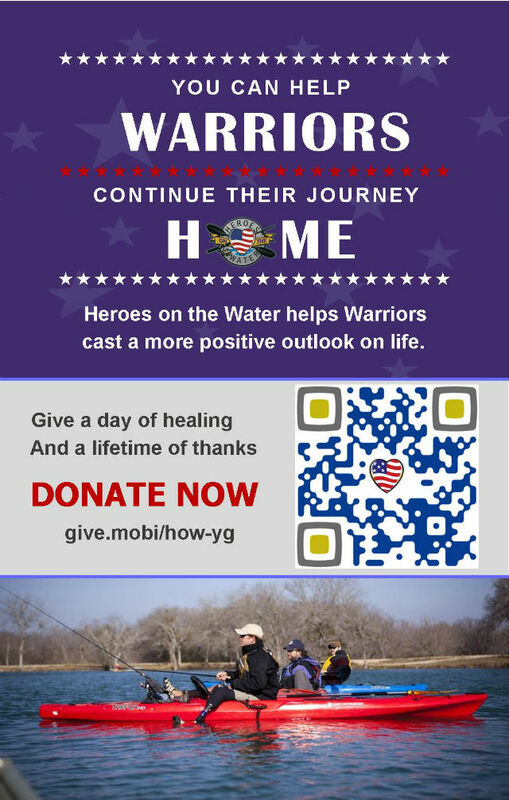 Yak Gear is proud to team up with Heroes on the Water – a 501c3 charity that serves our nation’s warriors by providing healing and rehabilitating kayak fishing outings that are physically and mentally therapeutic through their nationwide community of volunteers and donors. Yak Gear has worked hand in hand with Heroes on the Water (HOW) since 2010 when we first supplied the US HOW chapters with paddle leashes for the newfound kayak anglers. After all, keeping a paddle secured is one less aspect of the learning curve that the veterans needed to deal with while enjoying their kayak fishing therapy. Founded in 2007, HOW’s unique kayak fishing program allows the participants a chance to decompress from the stresses associated with combat and the physical rigors of rehabilitation. Warriors enjoy these benefits while on guided fishing trips held in local communities around the country. Participants receive basic kayak fishing and paddling instruction, angling clinics and paddling classes for participants with skill sets ranging from beginners to the most experienced paddlers. The program also assists these personnel in adapting these newly developed skills to their new abilities. Adaptive kayaks, kayaking accessories, and angling equipment is offered on an as needed basis to accommodate a soldier’s particular needs. The program is unique in that it is a long-term activity, not a one-time event. Yak Gear and HOW believe that the effectiveness of the program is a direct result of engaging the wounded military personnel for the long-term. One soldier, at the Center for the Intrepid, called what we do “Triple Therapy” or “all at once therapy.” On post he has to go to the gym for physical therapy, then go upstairs for his occupational therapy, and then go to the psychologist for mental therapy. With kayak fishing he gets it all at once – physical therapy from paddling and fishing, occupational therapy learning a lifetime sport/activity, and mental therapy from relaxing in nature with no distractions or expectations of performance. Interested in learning about Heroes on the Water events in your area? You can browse their Events Schedule or their How to Help listings. As an alternative form of getting involved, Yak Gear is also hosting a fundraising page through the GiveMobi site to collect donations from interested donors. We want to know what you think about our new donation platform for Heroes on the Water! Have you ever volunteered at a HOW event? Interested in learning more? Tell us what you think! Comment below, reach out to us at socialmedia@yakgear.com or find us on Facebook, Twitter, and Instagram using the #YakGear hashtag!